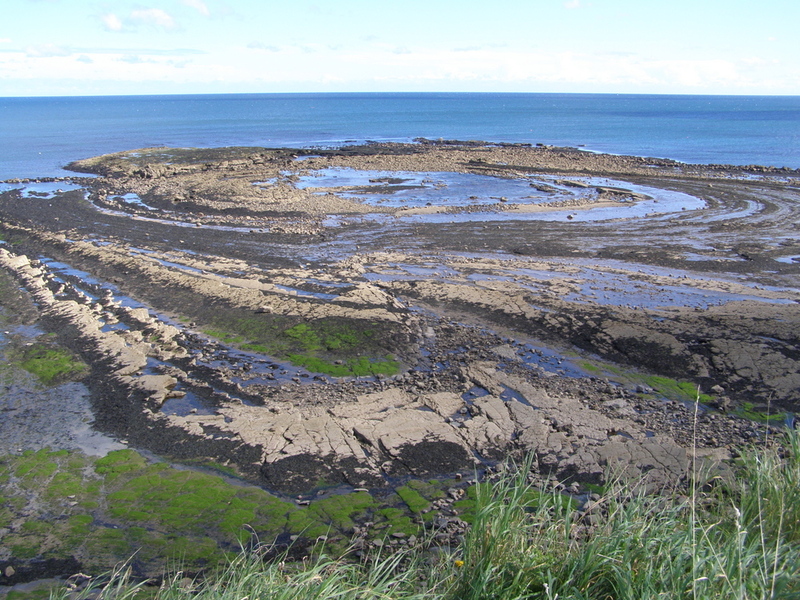 This visit to coastal exposures around the town of Berwick-upon-Tweed will examine good coastal exposures of cyclothems, deposited in river deltas, swamps and shallow sea close to the equator. The strata include coal, fireclay, limestone and sandstone, some containing fossils. We will also examine structural evidence for the Berwick Monocline and associated faults, formed during the Variscan Orogeny. Note: this excursion is repeated from 2017, as part of a weekend visit by Yorkshire Geological Society; EGS members are welcome to attend, but transport from Edinburgh is not provided. To examine the fossils and features of the coals, fireclays, limestones and sandstones of the cyclothems of the Lower Carboniferous Alston Formation and see structural evidence for the Variscan Berwick Monocline and associated faults. Train from Waverley Station, Edinburgh, at 9.08 arriving Berwick at 9.51. Return train at 16.14 arriving Waverley at 16.56 (times tbc). Private cars meet at Berwick beach car park NU 002 536 at 10.15. Berwick Station at 9.51 to be met by leader to walk to Berwick beach car park NU 002 536 to meet car drivers at 10.15. Berwick beach car park NU 002 536 at 10.15. No charge, but limited spaces. Toilets and ice-cream van. Short walk N to Burgess Cove, then walk S towards Berwick pier along cliff path to visit beaches. Follow section of Berwick ramparts to quayside at Berwick old bridge. Footpath along N side of R. Tweed to return to Berwick station. Bring picnic lunch. Total walking distance about 5 km along footpaths and coastal path. Steep steps to Burgess Cove. Rocky shorelines. Minor height gain. Cliff paths, but these are well-used and fenced off in precipitous locations. Cliffs beside beach sections. Low tide mid-day. Warnings of potential dangers on or near cliffs will be given. Hard hats advised if participants wish to go close to the cliff faces. Public toilets at Berwick beach at the start/end of the excursion, in Berwick and at Berwick station.